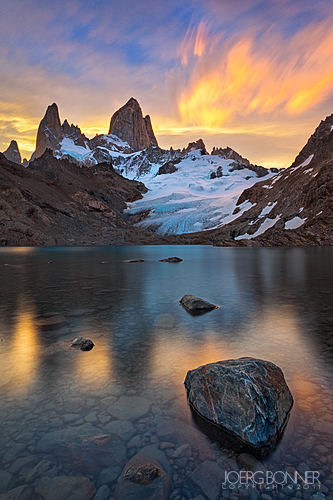 Patagonia and especially Parque Nacional Los Glaciares is a photographer's dream. I had no idea how beautiful it would be when I was planning our trip. I knew that it was going to be one of the highlights of our 8 weeks trip through southern America, but it turned out to be more than that. Getting to El Chalten (a small village in the mountains, that was mostly built to accommodate climbers and trekkers) took us longer than we thought. Our bus arrived late at night and we still had to find us a room. We ended up in a small hospedaje (I don't remember the name) sharing our room with another couple. The next morning we got up early to find us a better place to stay and organize our trip into the park. El Chalten had more to offer, than we initially thought (apart from a tent we also managed find a few places that offered delicious food and even a shop with exquisite wines and homebrewn beer). When we had everything together we decided to scout the village's surroundings for a sunrise location. The one that was the easiest to reach was Mirador de los Condores. The next morning I got up 2 hours before sunrise and walked to the lookout again. It takes about 1 hour to get there. It was cold and I had to put on all the clothes I had with me. When the sun came up a few clouds were still hovering above the Fitz Roy massive. 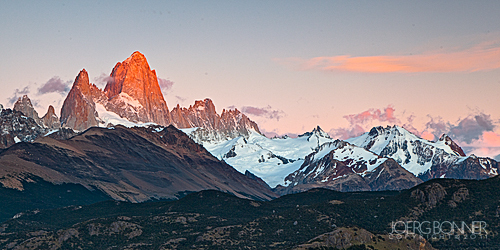 The first rays reached Cerro Fitz Roy and for a few seconds the peak was glowing red. After breakfast we left El Chalten for Fitz Roy basecamp. Campamento Poincenot as the campground is also called is a 4 hours walk away from El Chalten. We followed a quite steep path that passes a lookout with a great view of the Fitz Roy massive. A stiff wind was blowing when we reached the lookout and despite the sun being very powerful it was rather cold. So we hurried on to the campground. We continued the path until we reach a little stream (Chorillo del Salto) were we stopped to take a few pictures. The light was harsh (it was early afternoon) so I decided to go for a black & white conversion utilizing the whole tonal range. When we reached Campamento Poincenot we were a bit surprised to find around 50-60 tents and lots of trekkers. We had not expected to find that many people in a remote place like this. There were people from all around the world. Some were well equipped climbers and some were totally inexperienced tourists to say the least. Personally I think it's good that a lot of people get to experience nature that way but I often doubt that some people realize where they are and what they are doing. I think that lots of travelers don't know enough about nature and the environment. For some it is important to experience nature to learn their lessons, but some will never learn. The way they are traveling the world (including remote places), just following their guidebooks, makes me sick. I am not a purist but I am strictly against spring-break mentality in remote places. I don't want to listen to any music, be it good or bad, when I'm in the mountains. And I don't want to have any liquor-drinking morons singing the whole night in a tent next to me. To set my anger aside, I continued to climb after we had set up our tent. I followed the path to Laguna de los Tres. The path is very steep and it took me more than one hour to climb another 400m. Despite I only had my photo equipment and something warm to wear with me I was dripping with sweat when I reached the small lake below Fitz Roy. 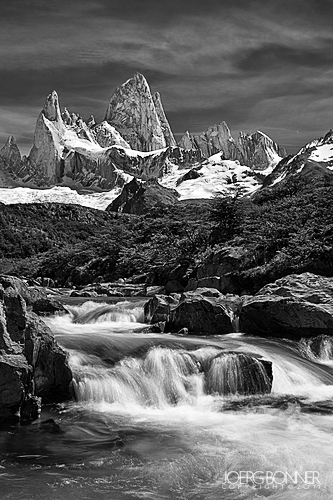 From there I had a great view of Cerro Fitz Roy and the surrounding peaks. After a short chat with two canadians, that had decided to spend their night up there, I descended to the shore to set up my tripod. For anybody spending some time in remote places I do recommend to follow the advice of Leave No Trace and if you would like to know more about how guide books are written I recommend to read Thomas Kohnstamm's "Do Travel Writers go to Hell?". Don't hesitate to get in touch with me! Feel free to ask me any questions regarding the images, places or whatever you want to know. All images displayed on this blog are copyrighted to the photographer Joerg Bonner, and must not be reproduced in any form (including academic and personal use) without prior written permission. To request permission to copy, display, publish, or other use these images, please contact the photographer.